As part of the process of renewing my visa to stay in Japan, I had to make an unplanned trip to Hirakata City Hall (about an hour's drive south) to pick up a copy of Fumie's koseki (family registry). On the way back, I came across the Yodogawa Kasen Koen, the Yodogawa River “Rivers Park” in Yawata City (Kyoto Prefecture), a mile-long raised berm in the middle of where three rivers join to create the Yodogawa River (which empties into Osaka Bay twenty miles later, a good mile in width by that point). 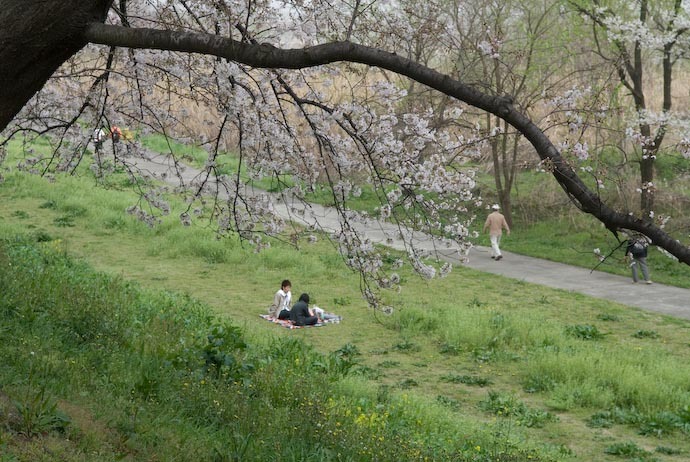 The park — the mile-long raised berm — is lined with hundreds of cherry trees along its entire length, making it a most pleasant place for a stroll. Photographically speaking, it wasn't a great day (it was exceptionally hazy, and the blossoms were just getting started), but it was short-sleeves warm, people were polite and relatively few, the air was not filled with alcohol, smoke, and drunken obnoxious laughter, there was no garbage, and overall, it was generally just really pleasant. The north bank was pretty much as you see it above. It went like that for most of the mile. 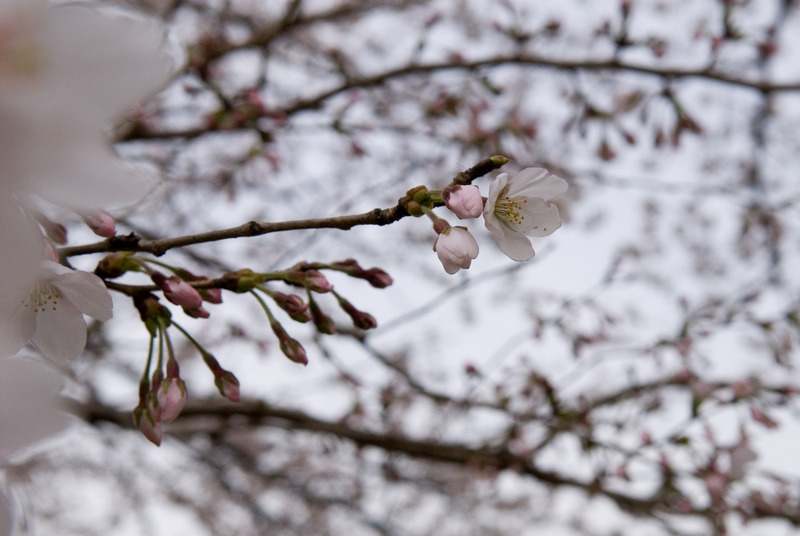 In some of the shots above it might seem as if the blossoms are filling out, but they're just getting going, as the branch in the next picture is typical of the current status of these trees. 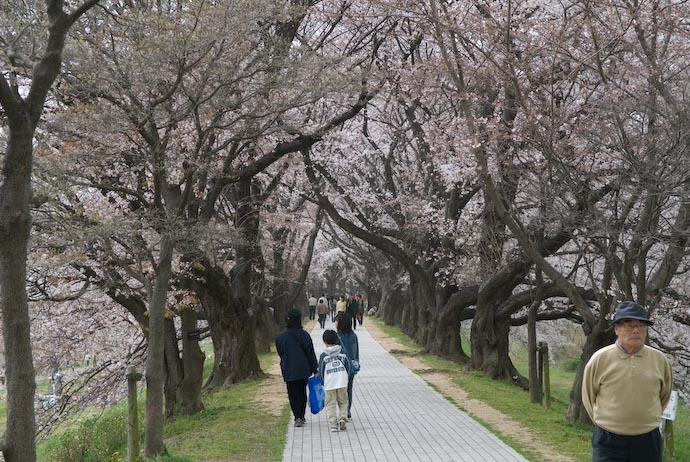 These trees were transplanted here from Tokyo, sometime during the Edo period (from 1603 to about 1867), so they're at least 150 years old, and perhaps much older. 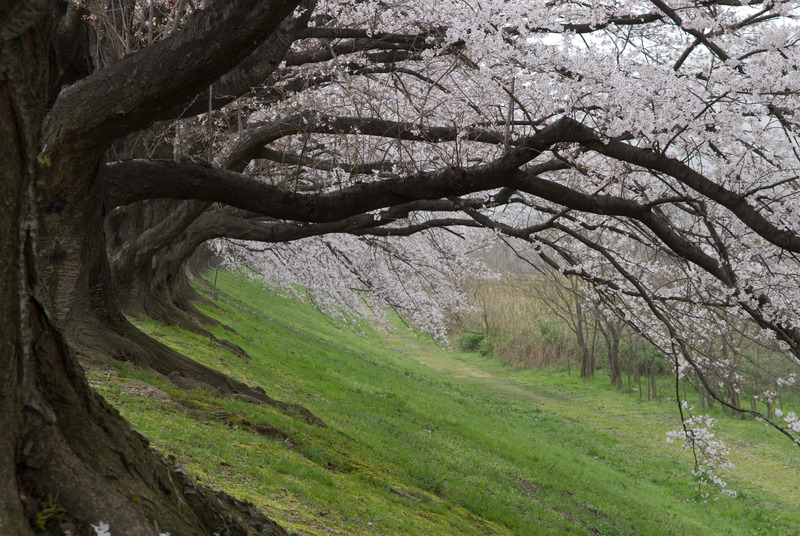 When I first ventured down the path, I had no idea what it was nor how long it was. 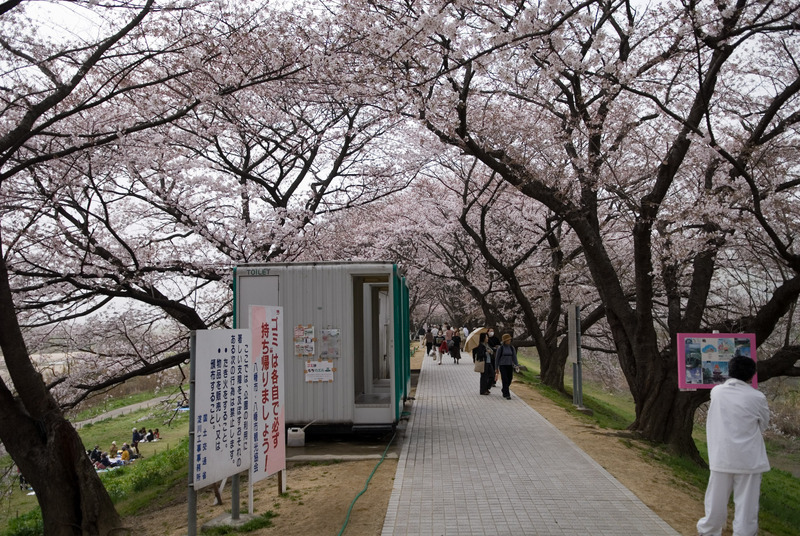 One of the first things I found was a semi-permanent toilet and some unsightly signs nestled under the blossoms. 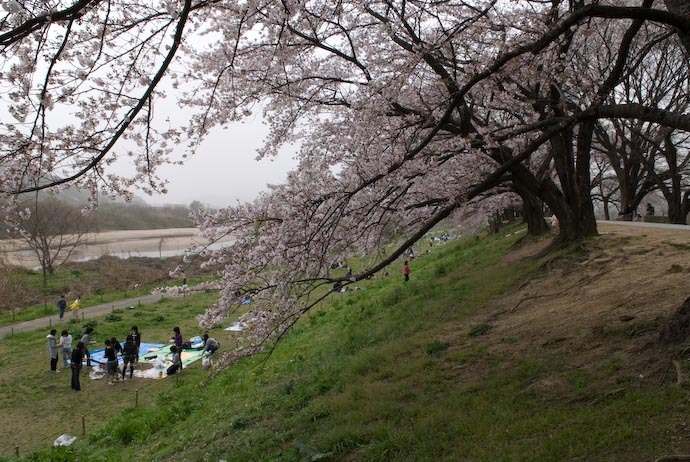 When this was the first thing I saw, I rolled my eyes, thinking that it was going to be a typically ugly cherry-blossom-viewing scene, filled with smoke, garbage, gaudy stands selling crap, and lots and lots of loud, drunk people. To my great surprise and greater appreciation, it turned out to be wonderful and, well, really pleasant. Nice useage of one of the “Word Power” words! By the way, we’ve got some beautiful blossom scenes along the numerous canals here in Koto-ku, Tokyo, Most notably the traditional Monzen Naka-cho area of Fukagawa. Thanks for your continued copyedit work, Andy :-). This one was just a typo (I had it correct in the img ALT tags), but must admit that I had to look it up. It boggles my mind that I could have gone this long without knowing the on-yomi for 川 is SEN. Thanks, also, for the park’s website! Yesterday’s haziness was actually the invasion of the windborne Chinese yellow sand, Kosa. Sorry, I only have a private ssl/password protected directory of photos on an apache server that my folks and sibs have access to. Anyway, after enjoying your fabulous stuff, I’d be ashamed to web-publish something even resembling a digital photograph. About the om-yomi for “kawa” (川 -> せん), besides “river” (河川 -> かせん) I can think of only two other Japanese kanji compounds that are worth remembering.